We’re one week out from the Detroit Auto show, 2016, which I’ll be attending. In this new market, many established auto manufactures have shown prototypes, made pronouncements, while young upstarts release their vehicles at CES, all while partnerships between established tech startups and traditional players are announced with great fanfare. This new Autonomous World has evolved from the Collaborative Economy movement: Uber, Lyft, Didi, Ola, BlaBla have all taught us that we don’t need to own a car to achieve mobility. We can summon a car, on-demand, using an app, whisking us away to our location, without the frets of parking, the stress of driving, and associated management woes of vehicle support. The tenant of “access over ownership” is also driving the Autonomous Vehicle movement, the pains of managing a car can dissipate. 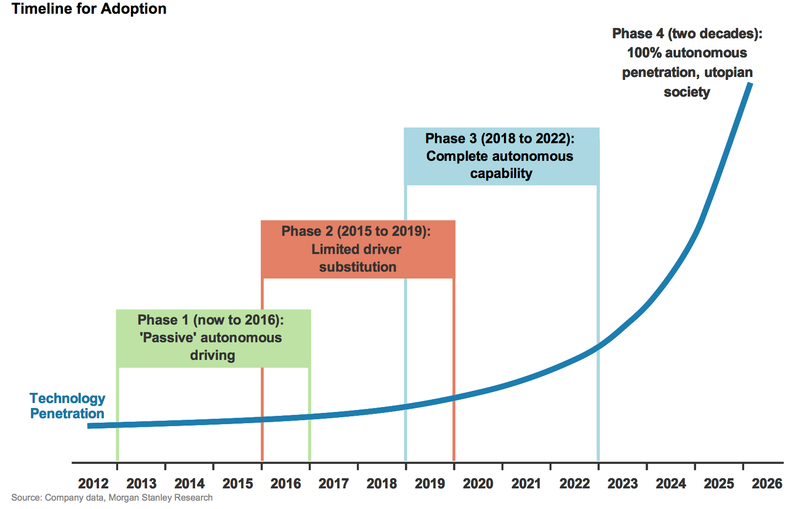 Before we move forward we must acknowledge when companies announce self-driving features, there’s a wide range of features, from driver assist (like helping to park) to autopilot features (auto slowing when a traffic jam is spotted ahead) to full autonomous like Google’s car –which lacks any steering wheel or pedals, learn about the four different phases of self driving maturity in this industry-referenced graph. While many car companies have secret prototypes testing away from prying eyes, the criteria of this will seek publicly referenced articles from credible source that include testing announcements, spotted prototypes or full blown unveilings. Jan 2016: GM invests in $500m in Lyft, prepares for self driving fleet. Expected players to emerge include Apple, who the press murmur will unveil a self driving electric vehicle. A quick analysis indicates: the deployments are coming from three groups: 1) Established mainstay auto manufactures, 2) Upstart players, like Tesla, Faraday, 3) Tech startups like Baidu, Google, Uber, and supposedly Apple. There’s a variety of deployments from simple self valet parking, driver assist features, to full freeway driving management. If you’ve updates, you can leave a comment below, or tweet at me at @jowyang, so we can collaboratively keep this list going, to show the acceleration of this arms race. Welcome my friends, to the Autonomous World.